If you want to refresh your memory of the course before race day – or if you want to check the course out for the first time before seeing it on race day – you should come to the Raven Rocks group run course check on Sunday, October 28, 2018 at 8am. The idea is to run the course with a group of fellow trail runners who know the course well. The course will not be marked and will not be timed. We will break up into pace groups during the run to check the course and make sure no one gets left behind. Meet at the Meadow Parking lot of Ward Pound Ridge Reservation. Details on the course check – plus information about our group trail runs every sunday of the year – are at SundayRuns.org. The Raven Rocks 10k Trail Run is set for its 4th running on Sunday, November 11, 2018 starting at 9am. We hope you can join us for this challenging race on the trails of Ward Pound Ridge Reservation. Click here — Registration is open now if you would like to sign up. This year will feature two slight course changes — First change is an extended tour of the Raven Rocks overlook with the newest trail in the Rez which opened in early 2018. 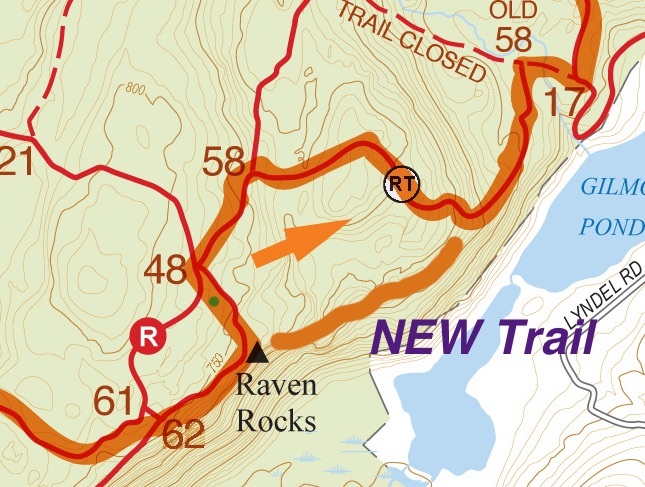 The new trail — I have given it the name “Raven Cliff Trail” follows the rock outcropping down through new single track trail. If this trail had existed in 2015 when we set the course it definitely would have been part of the race — and now it is! More rocks and more ravens! Second change is a re-routing of the Blue trail around mile 4.75 around 1/2 mile after the fire tower water stop. The new trail cut avoids some of the worst eroded parts of the blue trail downhill and is super smooth with good footing. The two changes actually slightly shorten the course from the original 6.3-6.4 mile (depending on whose GPS watch used) range. Depending on the rainfall in the week leading up to the race, the Michigan Road swamp trail cut-through may have to route through the main Michigan Rd access trail. This change, if needed, adds back in about 0.1 mile to the course. Our best advertisements are you — the runners! Please pass this website page on to a friend who might like to know about the race (and the Trail Mix Series). -Rob Cummings, Raven Rocks Race Director.